myLittleBackup is a tool any provider offering the MSSQL family of services should not be without. The application's ingenuity and intuitive features make it customer centric, easy to deploy, easy to manage, and rapid to scalable. Thanks to its valuable functions via its easy to use web based interface, myLittleBackup removes many time consuming tasks that could only be done by an SA in the past. Prior to myLittleBackup we use to get about 15-30 tickets a week from customers requesting backups and restores for SQL, since we have introduced myLittleBackup we no longer receive tickets for these requests, which is excellent. myLittleBackup is an administrators dream! 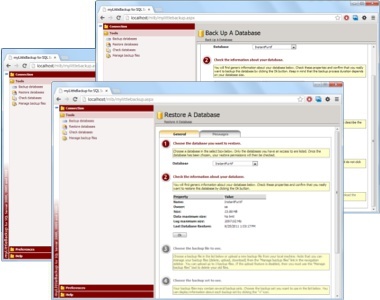 Any credible DBA knows that backup and restore within SQL Server have their problems when the files are taken from different servers, different databases or even different users; myLittleBackup solves all these problem by 'cleaning up' after any operation to ensure the customer does not receive anything less than pain-free backups/restores. When we were initially offering Microsoft SQL we had a policy of accepting a backup of a DB and restoring it over a created database. This worked for the vast majority, however as our client base expanded, the amount of people wishing to access more and more of SQL Server's functions grew with it. In May of 2007 we purchased and installed. Overnight the issues we had experienced disappeared. It is an amazing product, easy to install and with a level of support that is second to none.